Ever think regular soccer games are filled with too many rules and metrosexual underwear models that fall over writhing in “pain” at the slightest touch? Here’s a solution for you: bubble soccer, a creation that turns “The Beautiful Game” into “The Most Entertaining Semi-Violent Game Ever.” The sport, which first started in Europe, is already popular in Japan and is steadily gaining traction in North America as leagues pop up around the continent. Besides playing for fun, it’s also becoming popular as a team-building event, which isn’t really surprising considering the playful insanity of it all. The basic goal of the game remains the same as regular soccer (or football, for the rest of the world that isn’t the U.S. or Canada): two teams face off against each other and try to kick a ball into the opponent’s net. But, that’s about where all the similarities end and the real fun begins—all players must wear a giant inflated bubble made of clear plastic while playing. Each one is roughly five feet across, weighs about 26 pounds, and has two shoulder straps on the inside so the bubble can be worn like a backpack. The bubble eliminates the chance for any fancy footwork or the possibility of a handball and opens the door for the game to become as high-impact as ice hockey. A popular defence strategy bound to piss off your opponents is to run into them as hard as you can and knock them over, taking them out of action as they try to get back on their feet. The hit, as well as the aftermath, is thoroughly entertaining for spectators. Players bounce off each other like pinball, and getting up isn’t as easy as it sounds—a lot of first-timers have to roll around like an over-turned turtle until they gain enough momentum to throw themselves back into standing position. Matches aren’t stopped when someone falls over, so it’s not uncommon to have several players flailing about uselessly at any given point during a game. Adding to the entertainment value of bubble soccer is the lack of structure and consistency. Since the sport doesn’t have an international governing body like FIFA (or anything that remotely resembles an international governing body at all, really), the rules of the game are flexible at best and differ wildly between leagues. The Dynamic Sport and Social Club league in San Jose plays with two 20-minutes halves and six players per team; GTA Bubble Soccer has three or four six-minute matches and four or five players. Funballz in Denmark uses regular-sized soccer nets, while Kiwi Bubble Soccer in New Zealand prefers ones that look like they’re about two feet tall. Some leagues have goalies; others say the goalie role doesn’t exist. Just in case you actually do manage to pick some rules and stick by them, the fact that you’re looking through two layers of slightly muddy plastic and are suddenly five feet wide will probably throw you off. But the all-consuming chaos that is bubble soccer is by no means a bad thing—in fact, it’s one of the cases where chaos actually makes everything more fun, and not in a demented-Joker kind of way. The sport embraces its own ridiculousness. 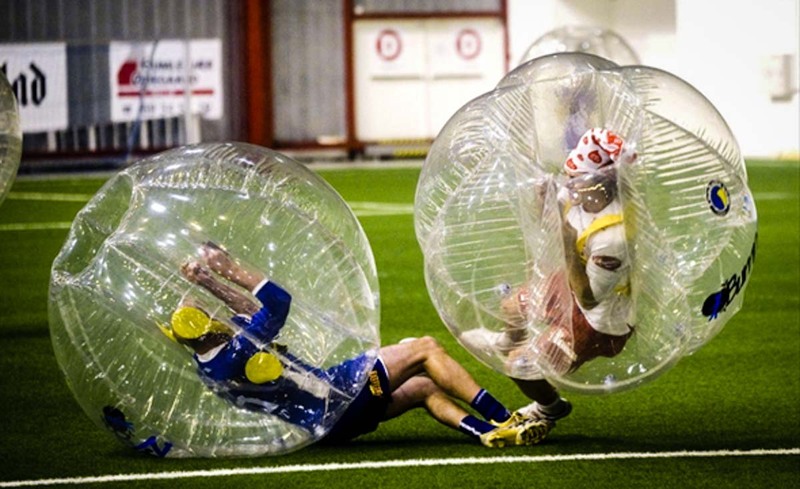 So, if you’ve ever felt the need to run into someone at full speed but don’t enjoy excruciating pain, or just want to have a good laugh, check to see if your city has a bubble soccer league of its own. It’s impossible to be unhappy when everyone is literally bouncing around the field.